It’s the 75th anniversary of the most iconic summer hangout in Texas. A grainy old family movie shows my 4-year-old self standing on the dam at Garner State Park, falling backward on purpose into the clear, refreshing water. Over and over and over. That was the first of my many trips to the park, famous for the Frio River, Old Baldy and summer jukebox dances. I started bringing my own children here early on, and we shared many a long, lazy float down the river. In those clear, cool, mostly shady and shallow waters beats the literal and figurative heart of Garner. The Frio officially begins at the junction of its east and west forks north of the park. It flows southeast across Uvalde County and through the park, later joined by the Sabinal River just before entering Frio County, and by the Leona River shortly before leaving the county. The Frio travels 200 miles, picking up the Atascosa River and a handful of creeks and filling Choke Canyon Reservoir before joining the Nueces River a mile south of the aptly named town of Three Rivers. Its drainage area totals 7,310 square miles. Park interpretive ranger Cara Bierschwale’s family lives on land containing the headwaters of the western prong. 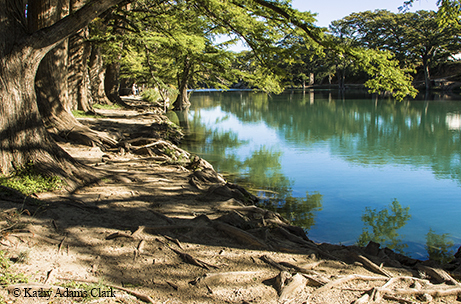 Shady cypress trees and the clear, refreshing water of the Frio River provide ways to beat the summer heat. “It comes from springs that gush out clear and cold like fire hydrants year-round,” she says, noting that the east and west prongs aren’t far apart — each runs about 15 miles before meeting in Leakey. 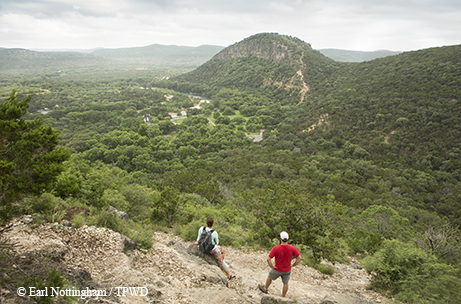 Almost three miles of the river wind through Garner’s 1,774 acres of scenic Hill Country terrain. “Frio” means cold in Spanish, and the name fits: Water temperature ranges from the high 50s in winter to the high 70s in summer, thanks to its origin in the chilly springs. The river sustains a variety of plants and animals, from bald cypress — which can stretch 120 feet tall and live 600 years — and sycamore along its banks to bass, channel and blue catfish, sunfish, bluegill and a variety of other fish beneath the surface. These waters also sustain a great deal of recreational activity. In addition to kids back-flopping into the river, people swim, kayak, tube and fish in it. The park rents kayaks and paddleboats at a kiosk near the dam, and the park store rents tubes and offers a shuttle service. December through February, when the water reaches its coldest, the river is stocked with rainbow trout. For me, tubing through the park on a hot summer day comes about as close to a perfect day as possible. The shuttle drops us eager tubers at the RR 1050 bridge, the park’s northern boundary, where we steel ourselves for that first contact with cold water. The trip’s never a dull moment. Slow shallow areas, sometimes requiring tube portage, are interspersed with occasional rapids, small waterfalls and nice, deep swimming holes. I pack snacks and a refillable water bottle in a waterproof container so we can take our time. Here and there, gravel beaches provide nice spots to warm our bodies in the sun (be sure to haul out only on the park side of the river, not private property on the opposite side). Tall trees overhanging water inevitably produce rope swings, and I confess that my kids often succumbed to the temptation. But Bierschwale points out that this pleasure involves trespassing (rangers remove any ropes on the park side), and a quick glance at the map demonstrates how remote the park is, should something go awry. It takes anywhere from three to four hours to travel the length of the park, depending on water flow, and we tend to stretch the journey out even longer. As we approach the original camping areas of the park, the river grows more crowded. Along the last stretch, which passes a broad shore dotted with picnic tables under towering old cypress, it becomes a water-borne party, jammed with people of all ages and types on floats, tubes and paddleboats, or just hanging out in the water. The party mostly ends at the dam, but immediately below it, the water courses through a shallow rocky area before emptying into several large, deep pools. This actually may be my favorite part of the park — deep blue water, Old Baldy towering overhead, tall trees lining the bank beneath the bluff. I could linger here for hours — and typically do, taking care not to stray past the park boundary. This crystal water has attracted people since prehistoric times, the first ones arriving some 12,000 years ago, followed by Native American tribes and, in the mid- to late 1800s, Anglo settlers. In the 1920s, German immigrants named Magers owned this property and opened part of it to camping. Between 1935 and 1941, the Civilian Conservation Corps used native limestone and cypress wood to build a lodge and the pavilion building, and constructed roads, culverts, trails, picnic tables, benches and cabins. 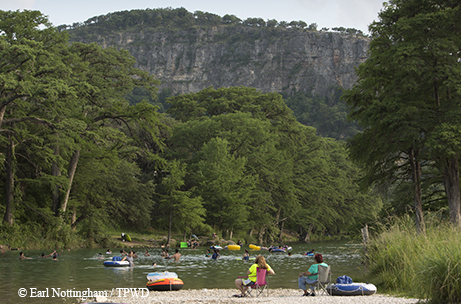 Garner State Park opened June 1, 1941 — and celebrates its 75th anniversary this year. Rock formations in the park date from the Cretaceous age, between 63 million and 138 million years ago, and include the Glen Rose formation, limestone, shale, marl and siltstone beds created by sediment along the edge of an ancient sea. That sea then spread over all of Texas, depositing Edwards formation limestone atop the Glen Rose. That limestone later uplifted, creating rugged terrain known as the Balcones Canyonlands, a subregion of the Edwards Plateau. Canyons in the park angle southeast to northwest, allowing them to catch cool winds and moisture and support more lush vegetation than in surrounding areas. This vegetation includes lacey oak, some very old Ashe junipers and Texas madrone. An uncommon, evergreen native, madrones grow 20 to 30 feet tall with polished, reddish trunks, white spring flowers and red or orange berries. Nearly eight miles of trails in a rugged, remote corner of the park between Old Baldy and U.S. Highway 83 make it possible to see Garner’s unique rock formations and vegetation up close. Many of these routes traverse steep, rocky hills, but beautiful scenery and views make the effort worthwhile. You can enjoy a taste of the river without getting wet on the half-mile Blinn River Trail. The trail veers to the water’s edge and up on bluffs above it, from the River Crossing camping area to Madrone Walkway, which continues to the pavilion. The east side of the Frio Canyon Trail also offers terrific views of the river. I’ll bet you can’t look at the Frio without getting in it. And if you shoot some video, you can enjoy it over and over again. Open daily 8 a.m. to 11 p.m. during peak season. Park closes when it reaches maximum capacity.